The Creative Movement Program is designed to develop motor coordination, increase spatial awareness, and provide a positive learning experience. Work is presented in an imaginative and age-appropriate manner to maximize each child’s enjoyment. Class size is limited to twelve students. Creative Movement classes present an in-studio performance at the end of the school year. This optional performance gives the dancers a chance to demonstrate what they have learned during the school year. Students must be four years old by September 1st Creative Movement 1 classes meet one time per week for 45 minutes. 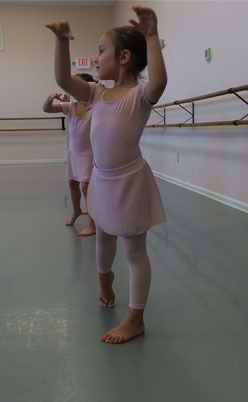 Students must be five years old by September 1st Pre-Ballet meets one time per week for 45 minutes.